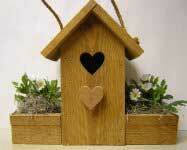 Return back to the Flower Pot Bird House page. Saw tapered ends. Use pattern for tapered portion of ends. Straight portion is 8 1/4". Using scroll saw, cut out heart per pattern. Heart is approx. 7" from bottom. If you do not have a scroll saw, you may drill a 1 1/2" hole instead of the heart. Saw all wood pieces per materials list. Install two tapered end pieces to base, 4 1/2" from end of base with 1 1/4" or 1 1/2" finish nails. Install side pieces between tapered ends and on top of base with finish nails. Nail roof panels to tapered ends with overhang in front. Nail flower pot sides and ends to base. Nail heart to front end piece. Staple 3/8" rope to diagonally opposite corners of roof. You may stain wood or leave it natural. Put flowers in flower pots.